For many of the spouses left behind after a deployment, the dreaded yard care looms as one of the top items on the worry list. If you have ever found yourself in the awkward position of relying on friends and neighbors for assistance, or if your family has been unable to pay for professional services, GreenCare for Troops just might be the answer. If you happen to love cutting the grass, read on, there might be help for your outdoor winter chores. GreenCare for Troops, with help from the Toro Company, is a nationwide program that matches lawn and landscape companies as well as individual volunteers in local areas to provide free yard care for active duty personnel who are deployed. GreenCare for Troops has recently added wounded and disabled veterans to their list of eligible recipients. More than 10,000 military families have registered for GreenCare for Troops since 2007. GreenCare for Troops has greater than 4,000 contractors who volunteer to be paired with military families. Florida boasts the most volunteer contractors and Michigan receives the most services. GreenCare for Troops was recognized by the White House in 2012 as part of its Joining Forces program for its efforts to support military families. Mike Rowe featured GreenCare for Troops on the popular Discovery Channel show, Dirty Jobs. The registration process for those in need of lawn care and for those companies willing to donate their time and services is simple and easily found on their website. If you happen to love yard work and enjoy the effort to beautify your home but hate outdoor winter chores, SnowCare for Troops might ease this deployment burden. Similar to GreenCare, (and its registration process), SnowCare for Troops relies on volunteers from the snow removal industry and has partnered with BOSS Snowplow to match deployed, wounded or disabled military members with winter weather removal professionals. 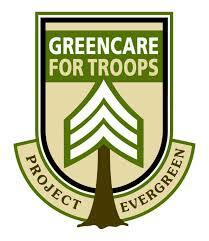 GreenCare for Troops and SnowCare for Troops are programs executed by the nonprofit group Project Evergreen. Project Evergreen’s revitalization projects can be found in parks, schools and public green spaces. They describe their organization as “committed to preserving and enhancing green spaces in our communities where we live, work and play.” Their designs can be found nationwide including Liberty Island, New York, the National Mall in Washington D.C. and several cities in North Carolina, Texas, Ohio and Toronto, Canada. Project Evergreen also supports the Art of Green Spaces Program. Students in the program create a poster to compete for prizes awarded to the student who best describes what green spaces mean to them. They are judged on individuality and artistic expression. For me, GreenCare for Troops would have been a huge relief and a great asset for managing lengthy deployments. Have you been the beneficiary of either GreenCare or SnowCare for Troops?